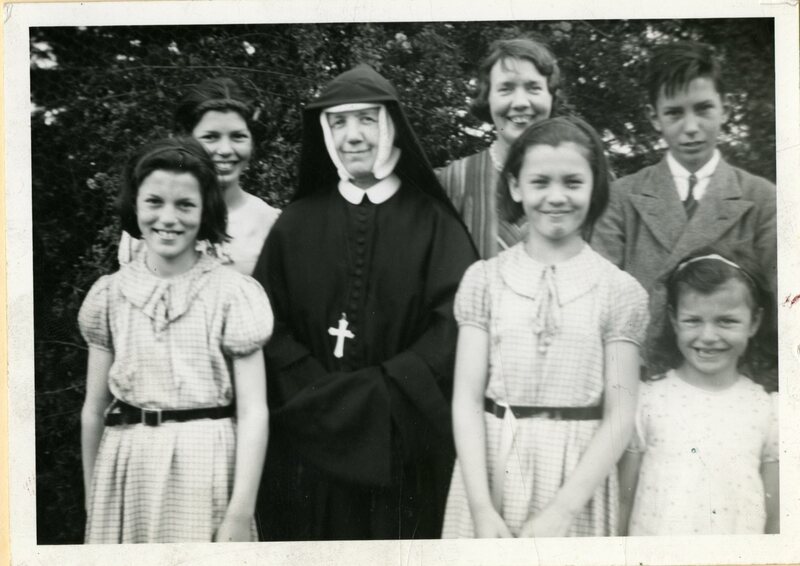 Mother Mary Ignatius in Ireland, circa 1939. Sister Mary Ignatius, an Irish woman sent to America by the Sisters of the Holy Child Jesus, arrived at Rosemont College in 1924. The College, just three years old, consisted of two buildings, eight teaching sisters, and forty students. By 1938, over two hundred students lived on a campus that had expanded to include Connelly Hall (1925), Gertrude Kistler Memorial Library (1926), Good Counsel Hall (1928) and Mayfield Hall (1929). Little wonder Mother Mary Ignatius became known by the nickname the Builder. She longed to add a chapel and students began raising funds in 1928, but the Great Depression delayed the chapel for almost a decade. The majority of the funding eventually came from Cardinal Dougherty, a stalwart supporter of Rosemont College. In 1937, Mother Mary Ignatius asked Architect George I Lovatt, Sr. to draw up plans for a chapel, only to have the General Council of the Sister of the Holy Child in Rome deny her permission. Finally official approval for a chapel arrived via telegram on March 18, 1939. 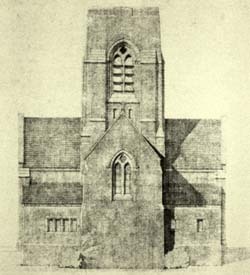 [Rosemont College Chapel] Proposed Chapel (Lovatt, George I., Sr., Architect, 1937) Lovatt Collection, Athenaeum of Philadelphia. In April of 1939, Mother Mary Ignatius once again request that plans be drawn up for a chapel, this time from the renown church architectural firm of Henry D. Dagit and Sons. While the chapel does not seem to be modeled directly on any other, Mother Mary Ignatius did visit the Ravenhill chapel at Philadelphia College. In consultation with Cardinal Dougherty, Mother Mary Ignatius selected the location of the Chapel so that it could be viewed from all points on campus. 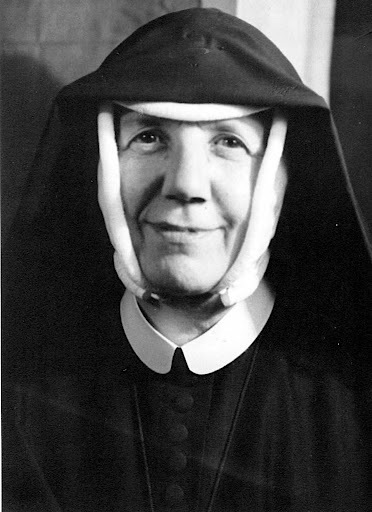 Sadly, Sister Mary Ignatius died on July 30, 1939. Her successor, Mother Mary Cleophas Foy, persevered in fulfilling her predecessor’s plans. 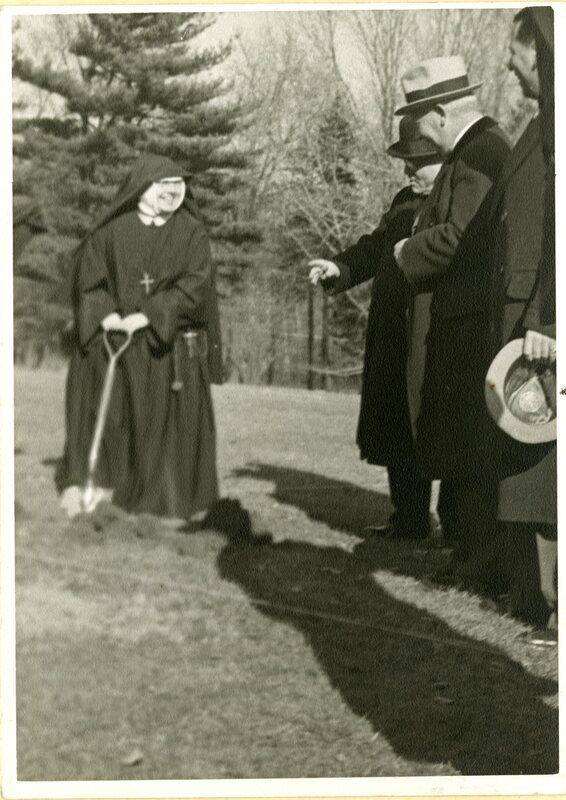 Groundbreaking for the Immaculate Conception Chapel occurred on March 19, 1940, the Feast of St. Joseph. 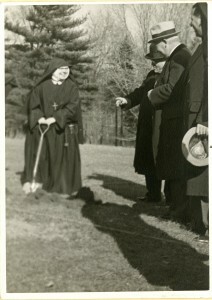 Students in academic regalia witnessed Cardinal Dougherty turn the first honorary shovel. Although originally plans called for first building only a crypt, at the groundbreaking it was announced that the Chapel itself was to be erected. Just ten months after construction began, the Chapel was completed. 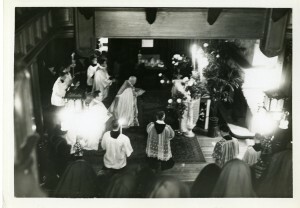 Pomp and ceremony accompanied Cardinal Dougherty on his return to bless the cornerstone in October 13, 1940. A brass box filled with photographs of various dignitaries of the Church, Sisters of the Holy Child Jesus, and a copy of the Rambler was inserted into the edifice as a time capsule. Dedication of the completed chapel on January 9 1941 was a momentous affair, celebrated with the Mass of the Immaculate Conception by the Cardinal and a sermon delivered by the noted Monsignor Fulton J. Sheen.